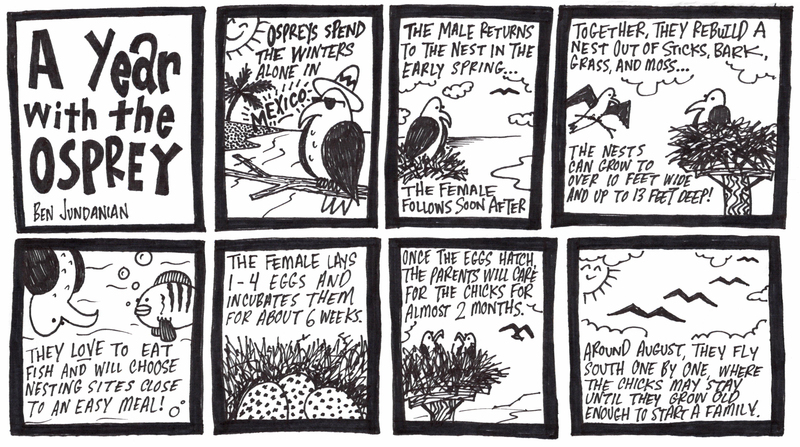 Ospreys – Get the Facts! Ospreys can be long term residents to long-distance migrants. Most ospreys that breed in North America spend their winters in Central and South America. Their migration routes follow broad swaths of the eastern, interior, and western U.S. A few overwinter in the southernmost United States, including parts of Florida and California. Primarily solitary birds, osprey roost alone or in small winter flocks of six to ten. 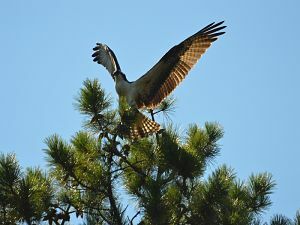 Osprey nests need to be in wide open areas (they’re not as good at maneuvering as other hawks) and have a wide, sturdy base that is far above the reach of predators like foxes and raccoons. Nests are usually built on treetops, snags, or human-built platforms. The male usually finds the site before the female. Ospreys use sticks to build their nests and line them with bark, sod, grasses, vines, algae, or flotsam and jetsam. The male usually fetches most of the nesting material—sometimes breaking dead sticks off nearby trees as he flies past—and the female arranges it. Osprey nests start out relatively small during a mating pairs first season (2.5 ft. wide and 3-6 inches deep). Each year, the pair will add to the nest. Nesting birds defend only the immediate area around their nest rather than a larger territory; they vigorously chase other ospreys that encroach on their nesting areas. The Osprey is the only hawk on the continent that eats almost exclusively live fish. In North America, more than 80 species of live fresh- and saltwater fish account for 99 percent of their diet. Captured fish usually measure about 6–13 inches in length and weigh one-third to two-thirds of a pound. The largest catch on record weighed about 2.5 pounds. Ospreys probably get most of the water they need from the flesh of their prey, although there are reports of adults drinking on hot days. Since they can only dive about three feet below the surface of the water, ospreys will stick to shallow waters where fish school near the surface like rivers, lakes reservoirs, lagoons, swamps, and marshes. Every summer, osprey pairs will lay one to four eggs that they must incubate for thirty-six to forty-two days. When the eggs have hatched, the parents will care for their young for fifty to fif ty-five days. 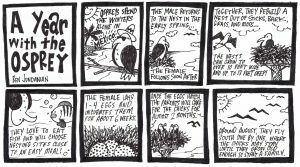 In August, females will be the first of the family to migrate south. The adult male will follow shortly after her and the young osprey will be the last to leave. The offspring will likely never see their parents again, and once they’re in their wintering region, won’t return north until they are about two years old. 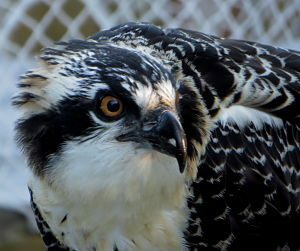 Ospreys are an excellent example of the power of conservation. In the early 1950s to 1970s, osprey numbers saw a sharp decline because pesticides like DDT poisoned the birds and thinned their eggshells. About ninety percent of the breeding pairs on the coast between New York City and Boston disappeared. 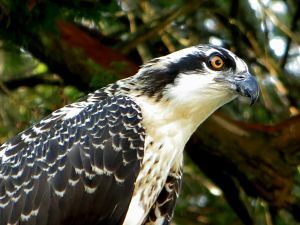 The plummeting osprey numbers supported wider legal arguments against the use of harmful pesticides. In 1972, the use of DDT was banned in the U.S. and osprey populations rebounded. They are a treasured part of Wareham’s natural landscape. Wareham Land Trust members help protect the coastal environment and food supply of these beloved birds and we should all be very proud every time we look to the summer sky and see one or more flying by.